I've decided that my blog should also be a place to record and analyze and chart my process as a writer. Right now I just throw stuff up here the way I pitch spaghetti noodles at the kitchen wall, hoping that they'll stick. But a writing life is often more complicated than cooking spaghetti. Then again, my writing life is within my control, which means it's only ever as complicated as I make it. Today I grabbed the reigns again and spent some time in the saddle. 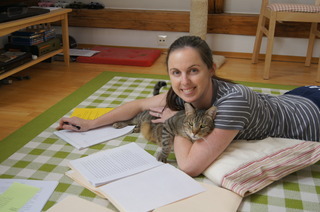 I sprawled on my green rug with my current drafts, a pen, and my cat (who was hugely happy with my choice). That's when it dawned on me. I'm writing, churning out this "art," but not until I pull back and look at it from above do I see the road I've taken with it. It's a long, meandering road. Sometimes aimless. Sometimes hopeless. But it keeps on moving even when I'm asleep at the wheel. A river of words. It's a river I've known all my life. I've been pioneering on it, face first into the dark, blank part of the map. Now it's time to fill in that map. To pick a bearing. To move that way.